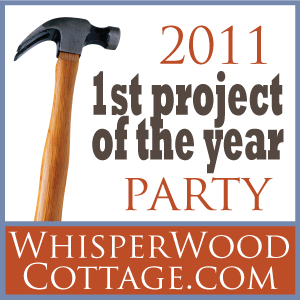 WhisperWood Cottage: Get Your Projects Ready for the 2011 1st Project of the Year Party!! Starts 1/11/11! Get Your Projects Ready for the 2011 1st Project of the Year Party!! Starts 1/11/11! The tree and xmas decorations have been put away. The vacuum cleaner was unclogged due to dog hair and pine needles (from said tree in #1). The utility closet was cleaned out and reorganized (does anyone really need that much speaker wire, old extension cords, and misc. whatnots?). The home office (which has not yet been show on the blog) is getting some sprucing up. I'll be sure to post as the process goes along! The kitchen got a good cleaning. The living room is in current disarray as I've been rearranging...it's been a long time for this room! New vintage pieces have made there way into the cottage...think storage! and medical! The blog got a new header and some new layout features (if you are viewing in a reader, click on over to check it all out!). It's still being tweaked here and there. Most importantly, I made a list of all the projects I'd like to do around the cottage. Not that they will all get done in 2011 (if they did, what would I do in 2012? ), but the list helped me to get all my ideas somewhat organized. GET YOUR 1ST 2011 PROJECTS READY FOR THE PARTY! I'm sure y'all have projects planned or in the works. Am I right? Well, if so, I want to see them. In fact, we all want to see them!! Projects can be anything...DIY, craft, decorating, sewing, health, photography, repair, trash-to-treasure, organization, cleaning...whatever your first project of the year is!! So, starting on 1/11/11 (that's January 11, 2011), we'll be partying here at WW Cottage with the "2011 1st Project of the Year Party." Grab a button and spread the word!! Yay! Can't wait! Our window trim went up in April and I finally painted it today! I am going to be productive this year! After only moving into my new/old home a few months ago, I have a basement full of boxes to rediscover and decide where or what to do with all these packed treasures...that's first on my list! maybe....?!?! oh boy! Can't wait! I'm going to put your party button on my site. I'm tackling our office makeover right now too- I'm so with you on not wanting to show it previously!!! Happy New Year! What a great idea for a party!! Love the button too!! I will be writing a list too but my focus will be on one word!! I have yet to announce it!! Coming soon!! I wanted to do all of that too! I didn't. Used up my free time to do gloriously nothing. But come tomorrow I am going to kick myself into action. Great idea. The first project of 2011. I'll have to think what would qualify for that. Recovering from the holidays is exhausting...I have been procrastinating...so many projects. I'll get cracking and link up. Happy New Year!